After retiring from school, Cleo needed something to occupy her time. Her desire was to take care of the foals and now alpacas. 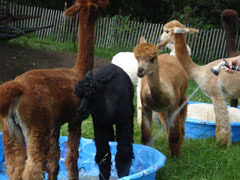 The alpaca world is new to the farm but is now a major part of the total operation. We started with fiber boys to give us yarn and the learning experience before getting into the breeding operation. We now have fiber boys, breeding males, and females that will be providing crias in early Summer. 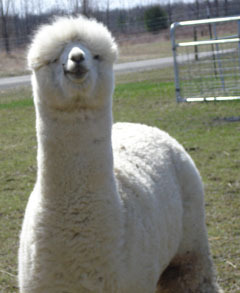 We have alpaca hand-made products, skeins of yarn, rovings for hand spinners, raw fleece and animals for sale. And we have now entered the world of showing Alpacas, quite a difference that showing the Saddlebreds. Easier handling and and a lot less training.